Quality theological study needs a variety of theological perspectives and voices. Limiting the voices that can influence your theological work trends towards limiting the effectiveness and quality of your theological work. 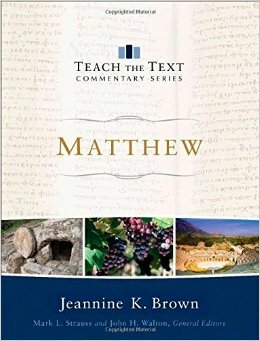 It is with this conviction in mind that I was so excited for the release of Dr. Jeannine Brown’s commentary on Matthew. Brown offers readers a commentary that beautifully combines quality scholarly research, with fresh cultural perspective. I was impressed with the achievements of this volume. Its brevity makes access the theological themes of the text easy, yet its scholarship is evident in both its insights and footnotes. It does not lose the relevant exegetical work in its efforts to be relevant to teaching. It is indeed a commentary series for teachers. The volume utilizes a number of headings to help teachers access the text’s main themes, and make connections for their audiences. So it offers readers contextual background information and interpretive insights, along with a section on “teaching the text” and “illustrating the text.” Here is where Dr. Brown shines. The need for competent female voices in the field of Biblical studies is evident. Without meaning to many pastors and Bible teachers read the Bible through the lens of their experiences as men. Brown helps us to see broader applications and understandings of the passage. One example demonstrated this powerfully for me. This is a significant insight that contemporary preachers and teachers need to hear. Teaching this text without this nuance can do great damage to those we aim to care for in our congregations. Most scholars, however, because of their experiences as men will overlook this nuance to application. Their teaching will be the worse for it. Brown is a competent scholar. Her footnotes reveal that she has interacted with all the right scholars, and her interpretive insights reveal awareness of the textual variants, challenges, and debates. Yet, her commentary does not get lost in these particulars but stays focused on making the meaning of the text clear. Readers will not regret picking up this volume. Jeannine Brown is a needed voice in theological scholarship today. I want to encourage my brothers especially to pick up this volume. Not only is this volume, as part of a good commentary series, a helpful tool for teaching Scripture, but Brown’s voice and contributions add some particularly unique qualities to our study that are much-needed. You will not regret utilizing this Matthew commentary in your studies, and your people, especially your women, will thank you for it.